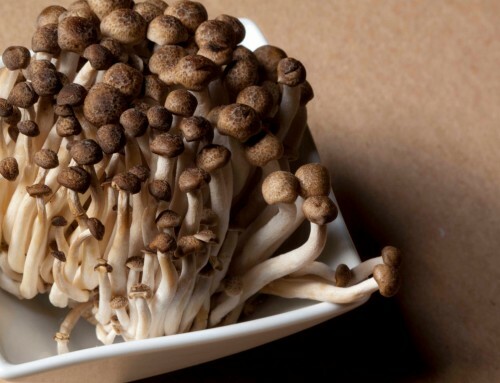 This mushroom is the second most widely cultivated mushroom in the world. It has been a popular food source in the cuisine of Asia for hundreds of years. Following recent improvements in cultivating techniques, it is rapidly becoming a favorite in markets and on dining tables. In addition, people can now grow it at home using simple kits prepared by mushroom specialty companies. It has been estimated that the origin of shiitake mushrooms can be traced to the cretaceous period, over one hundred million years ago. It is found growing wild in the mountainous regions of China, Japan, Indonesia, and Taiwan. The scattering of shiitake spores has been traced using typhoon wind patterns as the mushrooms were dispersed from one to the other of these countries. It is not found wild in the United States or elsewhere. In China it is called dongo and shanku. When served in Chinese restaurants here it is called “the black forest mushroom.” The Japanese call the most highly prized and priced specimens donko. These have closed caps. Koshin types (spring season variety) have open caps and are less expensive. 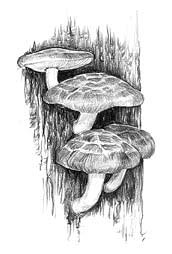 The Chinese were the first to cultivate this mildly fragrant mushroom more than six hundred years ago. Yield and quality varied from year to year until scientific techniques were developed. Japanese scientists developed a method of inserting pencil-shaped plugs of mycelial spawn grown from specially selected varieties of Lentinus edodes into holes bored in oak logs. Carefully watched over in the forest, the prepared logs carried out the work that supported the entire shiitake industry. Today it is grown in the United States as well as in Asian countries on a variety of materials containing cellulose, such as sawdust enriched with rice bran. It is sold fresh as well as dried. 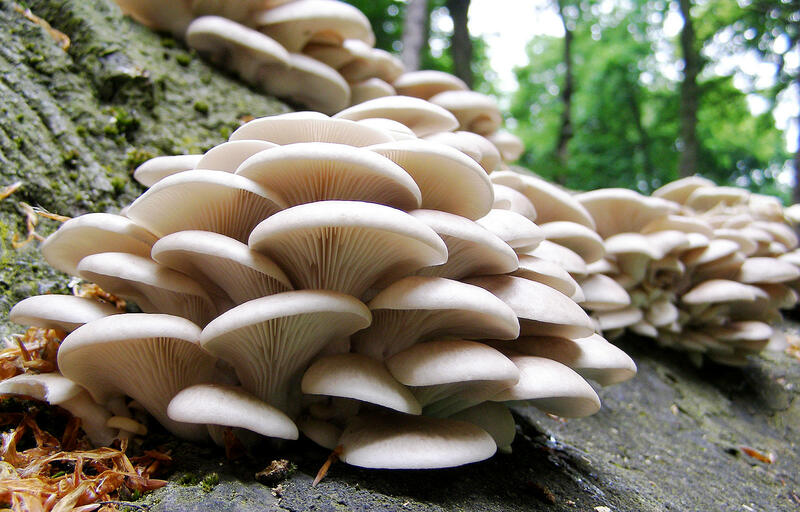 In Japan and China the chemicals found in shiitakes have been analyzed for medicinal properties. Extracts have been used in treating cancer, and claims have been made that they reduce cholesterol, enhance sexual power, prolong life, kill viruses, and improve circulation. Most people will be skeptical of such panaceas, but at the very least, this is the most enjoyable way of taking medicine we have experienced. Read Mushrooms As Health Foods by Kisaku Mori if you want to know more about the subject (see Bibliography). Shop with care when purchasing dried shiitakes, since there are many grades and prices. The caps may be thick and fleshy, or thin; large or small; cracked on top or smooth. The very thick, cracked-topped donko types are expensive, but worth the price. They are meaty and can stand up to any food. In the United States bottled extracts of shiitake are sold for medicinal purposes, and it is packaged as a powder. 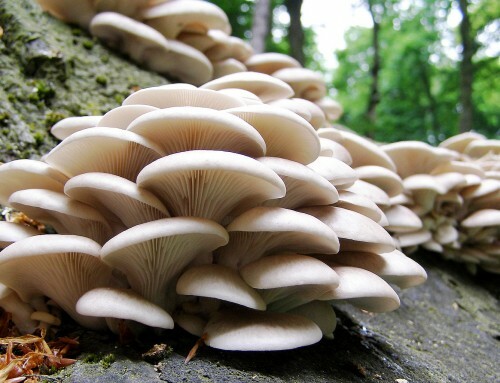 Because shiitakes grow on wood or other coarse cellulose materials, the fresh mushrooms are very clean. Brush the caps lightly. As a rule, the stems are tough, so cut them off using a knife or scissors. The stems can be used to add flavor to stock. 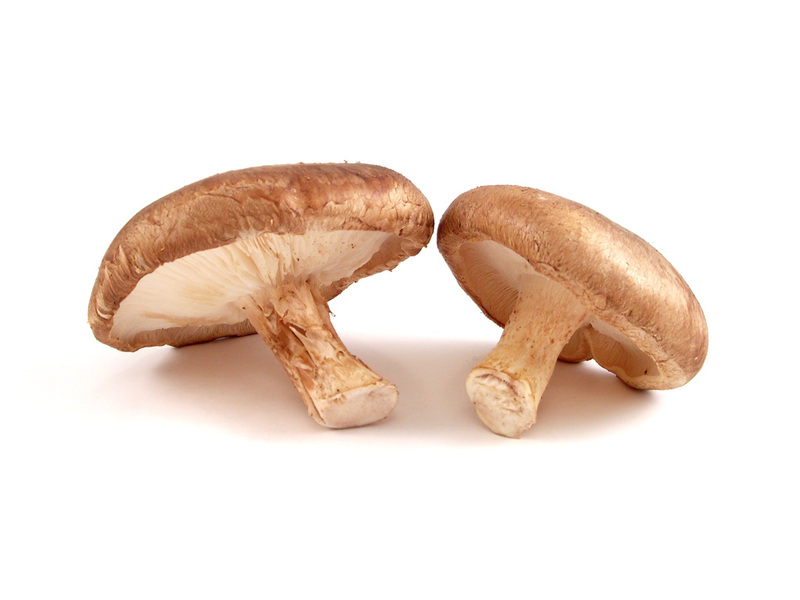 Shiitake mushrooms will enhance the flavor of most foods. It is also tasty by itself, cooked several different ways. It accents vegetables, meats, seafood, poultry, and even other mushrooms. 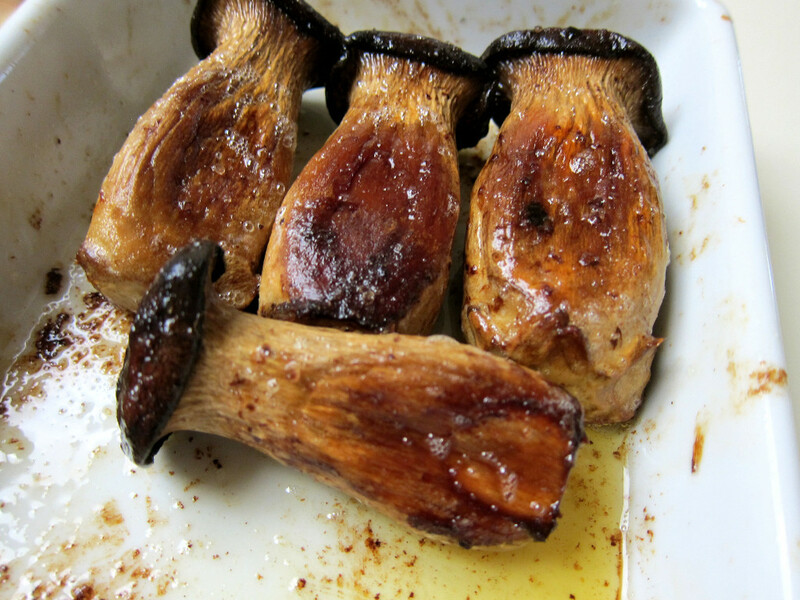 The classic way of handling dried caps is to simmer them in water with a little soy sauce to make a shiitake bouillon. Added to a light cream sauce, the shiitake is ideal for flavoring pasta dishes. Reconstitute dried mushrooms by soaking in hot or boiling water for 20 minutes. Save the liquid to include with your food for another dish. Pour off the liquid at the top to separate it from any debris at the bottom of the dish in which it was soaked. When dried, they store well in closed glass containers. 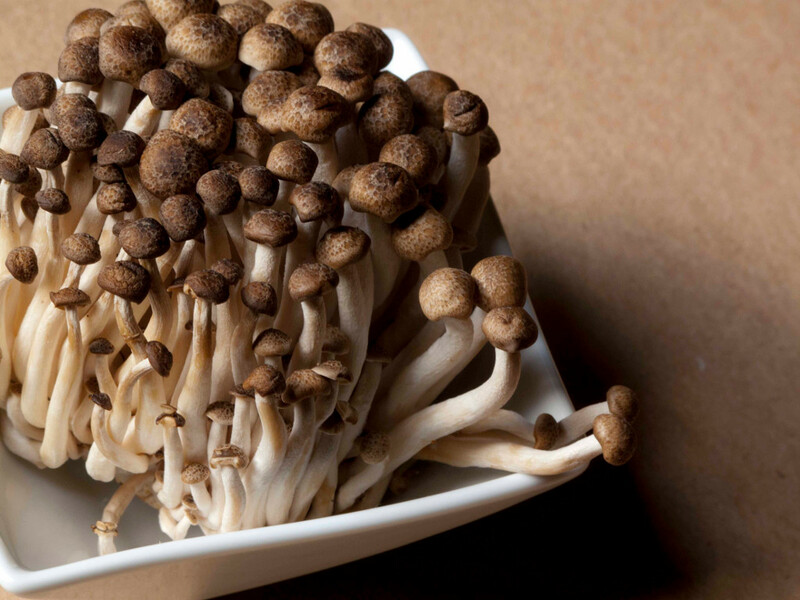 Prepare these mushrooms in a container that fits into a steamer. Save the rich juice and pour it over white rice. Soak the mushrooms for 15 minutes in hot water to cover. Drain and squeeze dry; reserve the soaking liquid. Mix the pork, green onion, ginger, soy sauce, sherry, egg white, and cornstarch. Mound the stuffing into the mushroom caps. Place in a heatproof dish that will fit into your steamer. Steam for 20 to 25 minutes. Toss the cilantro on top. The flavor of shiitakes is outstanding. In this soup, dried shiitakes are cooked with common store mushrooms. Bring the beef broth, barley, dried shiitakes, and potatoes to a boil; reduce to a simmer. In a sauté pan or skillet, sauté the onion and common store mushrooms in the butter until the onion is translucent. Mix in the flour and stir for 1 to 2 minutes. Stir in the white wine and add the thyme. Gradually stir this mixture into the soup using a whisk to prevent lumps from forming. Add salt and pepper to taste. Continute to simmer the soup for 20 minutes or until the barley becomes soft. Rub the chicken breasts with lemon juice. Arrange the chicken in a baking dish and bake for 15 to 20 minutes in a preheated 400º oven or until the breasts are brown and juicy. Turn the chicken occasionally while cooking. While the chicken breasts are cooking, pour the 1-1/2 cups water into a medium saucepan. Add the garlic, ginger, soy sauce, and the mushrooms. Simmer uncovered for about 15 minutes. Adjust the taste. If too salty, add more water. If not, add soy sauce. Place 3 caps over each breast on individual plates and spoon the sauce over each breast. 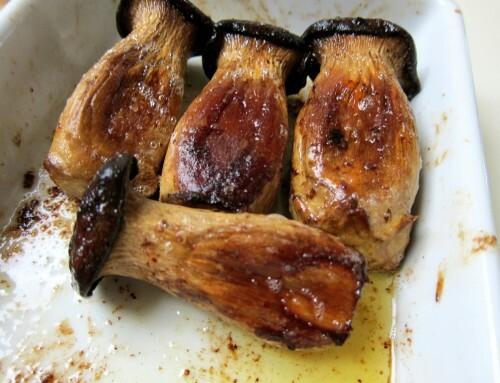 If using dried mushrooms, rinse them and set aside. Dredge the chicken in the flour. Fry the bacon in a sauté pan or skillet until crisp. Remove to a paper towel with a slotted spoon. Add the chicken pieces to the pan and brown on all sides. Transfer the chicken to baking dish with a cover. Add the onions, mushrooms, garlic, bacon, soy sauce, red wine, and salt and pepper. Cover and bake in a preheated 350º oven for 1-1/2 hours or until the chicken is very tender. The black bean sauce in this recipe is a thick, salty paste made from fermented yellow soy beans. It is available in Asian markets, along with the Asian sesame oil. The shiitake mushroom blends well with this special sauce. Serve over rice.